In general, I’ve been disappointed with many of the iPad apps categorized under Education. With new apps being added (270/day in June 2011), I’ve got to admit it’s getting better. A little better all the time. As Orwell Kowalyshyn and/or Kevin Amboe mentioned last spring, apps from other categories such as Games or Photography may provide richer educational opportunities for students. Students will benefit from iPads in the classroom not because there’s an app for practicing number operations, but because there’s an app for communicating their thinking. ShowMe, ScreenChomp, and Explain Everything have been listed/discussed in many math ed blogs. Students, not their teachers or Sal Khan, can create video explanations using these interactive whiteboard apps. Meeting with Surrey & Vancouver secondary math teachers this summer, one teacher showed us a picture of two containers each filled with chocolate eggs. The number of eggs in the smaller container was given and we were asked to guess the number of eggs in the larger container (see Dan Meyer’s blog). Using her iPad 2, the teacher filmed us giving and justifying our estimates. In a classroom, teachers or, better yet, students could interview peers, administrators, parents, members of the community, etc. and then share and discuss these guesses and strategies. One app that I had fun with this summer is iMotion HD. This app allows you to create and share stop motion movies from pictures you have taken. 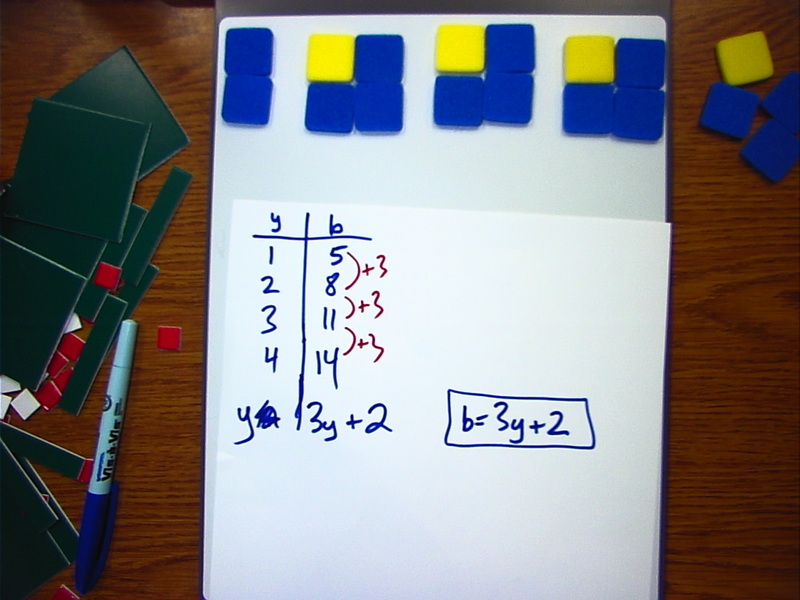 In the video below, I show why 1/2 + 1/3 = 5/6 using pattern blocks. Using iMovie, I could have added narration but I chose not to. Why? Because I have no plans to share this with students*. I chose not to narrate my movie because students, not the teacher, should be doing the math. In this way, students communicate to learn and learn to communicate. *Also, I have only one nephew. He is 18 months old and so far has been able to complete his algebra homework without asking his uncle to tutor him. The Khan Academy has already been widely and deservedly criticized by others. Please check out Karim Ani’s An Open Letter to Sal Khan on his Mathalicious blog. How come we’re playing games today? I thought this was math class. Inspired by reading the tweets & blogs of Surrey teachers over the summer, I thought I’d resurrect my blog. In his blog, Richard deMerchant writes about how games, in addition to being fun, can help develop conceptual understanding of mathematics (http://rvdemerchant.wordpress.com/2011/08/31/count-down-part-two-games/). He also writes about the impact that debriefing strategies (“Why did you make that move?” etc.) has had on his son’s thinking. I have seen this in my daughters as well. My 6-year-old loves the game/puzzle Camouflage. The challenge is to place polar bears on ice and fish in water while also having the game pieces fit on the board (see http://www.smartgamesandpuzzles.com/inventor/Camouflage.html for a better description). As she was playing, she went to place a piece down and then stopped herself saying “That can’t go there. It’ll make a square”. I asked her to explain this to me. She had figured out that if a move created a blank one-by-one square, then she would not be able to fit all the pieces on the board. (The game pieces are one-by-two dominoes or L-shaped triominoes). She developed this strategy on her own. As she completed the increasingly more difficult challenges, I could see her develop problem solving and reasoning skills (as well as spacial sense). In defining math, most of us math teachers will probably use words like ‘problem-solving’, ‘reasoning’, ‘patterns’, ‘estimation’, etc. (Would our students use these words or would they use words like ‘memorize’, ‘rules’, ‘formulas’…?) Compare a lesson in which students play (and discuss!) Blokus to one in which the teacher shows students how to divide rational expressions (1. factor numerators/denominators, 2. invert and multiply, 3. cancel) and students practice questions similar to the examples. In which lesson might you see the words listed above? In which classroom are students doing math? I really enjoyed Marc’s Patterning the Blues activity (taken from Marian Small’s Big Ideas book that department heads received). 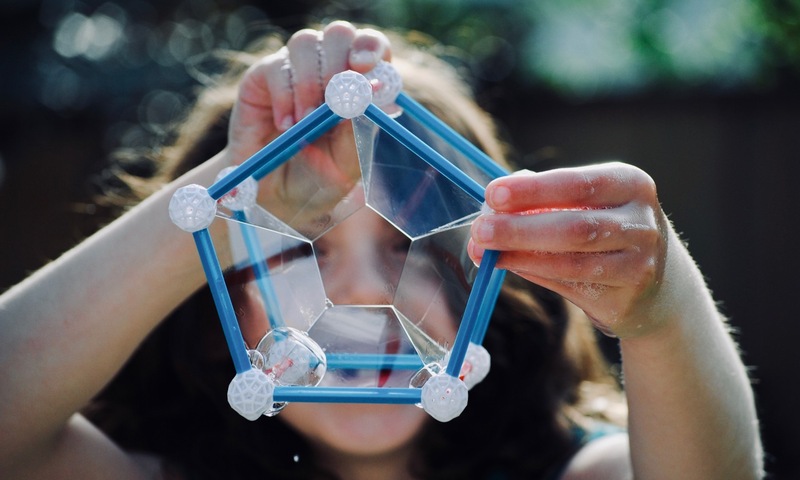 Teachers often talk about how manipulatives can help the struggling learner. I’m suggesting that having students solve problems concretely can assist all learners. When I experienced this problem using the blue and yellow tiles, I gained a deeper understanding of the problem. The equation y = 3x + 2 now had meaning. I was able to find the pattern in the table to determine the number 3. By modelling the problem using tiles, I was able to see this as adding an extra 3 blue tiles every time the figure grew. Your students who used to get it symbolically will still get it if they approach it concretely. However, what it means to “get it” in your classroom will start to change. I’d appreciate your comments. Maybe you have some thoughts on how this activity addresses the 7 processes?